A game by Ludic Studios for PC, Mac, and Linux, originally released in 2018. 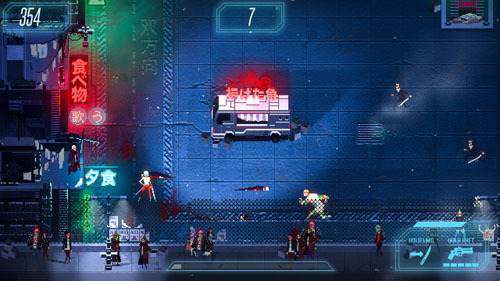 The game’s primary goal is to kill as many enemies as possible, which will see the player diving into increasingly difficult challenges, including a number of boss encounters. However, simply killing bad guys isn’t all there is to the game, as the game features a combo system, a stamina meter, a kill-driven special attack meter, and numerous secondary objectives that allow the player to unlock new items and equipment. Despite the fast-paced score-driven gameplay, the game's initial release has no controller support, but the developer plans to add this in an early update. 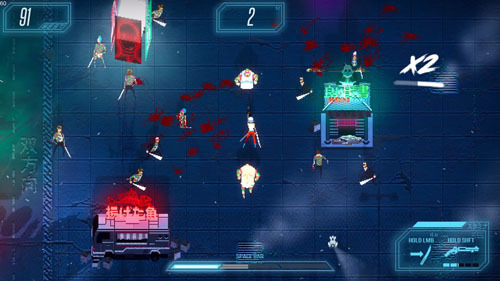 The game is presented as an arena combat actioner with the player fighting endless waves of enemies in a large enclosed area, with a few obstacles spread around the playfield to act as obstructions to movement, or defense against the occasional gun-toting henchman. However, unlike most entries in the arena combat genre, the game is largely melee based and features one-hit kills for the protagonist and most of her enemies, and getting killed sends the player back to the start of the game. All of the game’s controls are explained in an optional tutorial that takes place as part of a flashback sequence, 23 years before the events of the main game. Here, Akane is a child studying with her master, Ishikawa, who asks that she perform each of the moves, and a year passes before she learns her ultimate dragon slayer technique. Akane’s primary weapon is a katana, which she swings quickly in one of four directions, although she can move freely in any direction, which makes diagonal attacks a bit unreliable. Akane swings her sword quickly, but each swing reduces her stamina somewhat, and running out of stamina renders her unable to attack for a few seconds as she gasps for breath and waits for the meter to recharge. Players may also let off the attack button for a moment to restore some or all of the meter. However, the amount of time it takes to restore stamina is only slightly less than the amount of time before the player’s combo streak is broken, requiring that the player be mindful of each meter if he wishes to make the most of his abilities and unlock new ones (more on this in a bit). Akane also has a handgun, which might seem a bit overpowered given that most enemies only carry swords, but the gun is balanced in such a way that players can’t rely on it to simply mow down every enemy that comes their way. 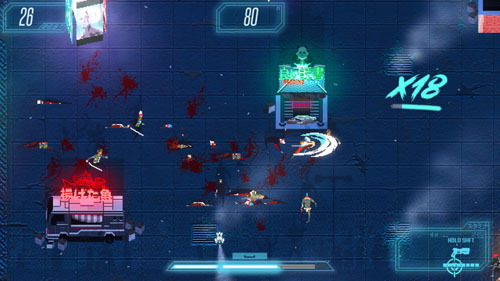 First off, the player cannot move and shoot at the same time, and enemies move toward the payer very quickly, so attempting to use the gun in close quarters is a recipe for instant death. Secondly, the weapon carries a very limited amount of ammo. 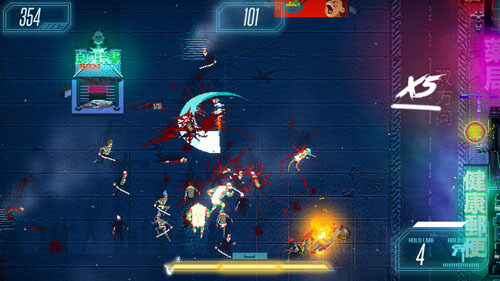 The ammo recharges slowly over time, or bullets may be restored by killing enemies with the katana, in a system similar to the one employed in another melee-based arena combat game, Skelly Selest. This forces players back to primarily using melee attacks and only using the gun when the situation allows… or forgoing its use altogether if the player so chooses. By killing enemies in rapid succession, a meter on the bottom of the screen slowly fills, and it fills more quickly if players string together long combos. The meter has three levels, and once the first level is filled, the player can unleash a deadly dash attack that kills multiple enemies in a straight line. Time slows down when the player presses the SPECIAL ATTACK button, and during this time the player moves a cursor to draw a line across the screen. When the attack is executed, every enemy along that line – and in a fairly wide swath near the line – is cut down, including enemies that would normally take multiple strikes to kill. The meter doesn’t remain charged, so if the player doesn’t keep killing enemies, it will eventually drain… although there isn’t much breathing room between enemy kills, so this is rare. 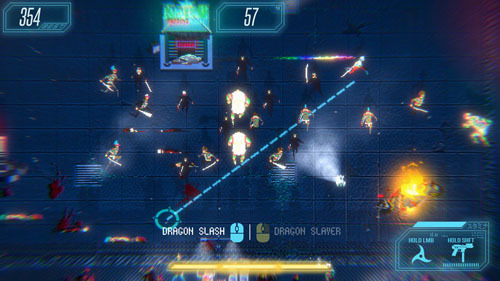 In addition, by charging the meter to its maximum, the player can unleash the dragon slayer, which has the potential to kill every onscreen enemy. 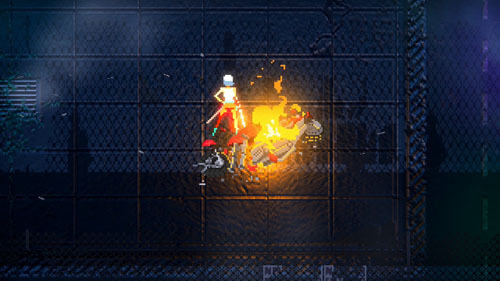 The player can also perform a dash to quickly move away from (or toward) incoming hordes of enemies, as well as a block maneuver that temporarily defends against attacks from any direction. The block can be used to avoid enemy sword attacks, but it’s also required to defend yourself against baddies with guns who can shoot you dead from across the screen. There are only five enemy types, but their sheer numbers and the danger of instant death keeps the action lively. The basic yakuza are the most common enemy. These guys have a few visual variants ranging from black suits to various states of undress that reveal their colorful full-body tattoos. When one of them gets close to Akane, he slashes his sword. Tougher yakuza - called tanks - will grab and pummel Akane into a pulp if they get too close, and tanks take multiple hits to kill. The aforementioned gun-wielding bad guys are called shooters. 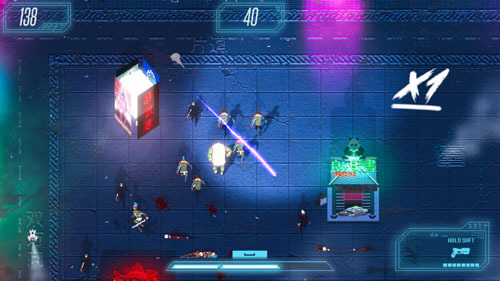 When a shooter enters the screen, a neon blue target appears over his head to signal the player of his arrival, offering a few seconds to react. If the player can move toward the shooter quickly enough, it’s possible to cut him down before he gets off a shot, and an audio cue lets the player know when he is about to fire. 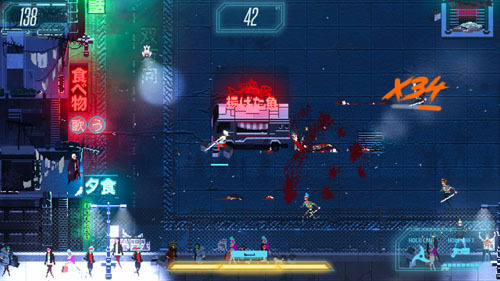 If the shooter isn’t killed in time, he will fire three shots that are nearly impossible to dodge, although the player can dash or get behind one of the arena’s solid objects. 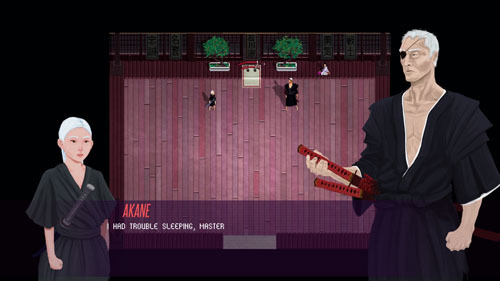 The preferred tactic for dealing with shooters is to perform a block, which causes Akane to hold her katana in a defensive position for a few seconds. During this time, she’ll block any incoming attack, including bullets, and getting the timing right is important because otherwise she’ll drop her guard while still under fire. Deflected bullets will kill nearby enemies, and if the player is close enough to the shooter, it’s possible that the bullets will be deflected back at him for a bit of poetic justice. Or, if you have a sure hand, you can swing your katana at the right moment to slash the bullets right out of the sky. There is another enemy type called a charger that can dash across the screen and kill you. Their appearance is rare, but they are hard to kill. Finally, there is Katsuro, who is Akane’s nemesis, and he appears as the game’s lone boss. 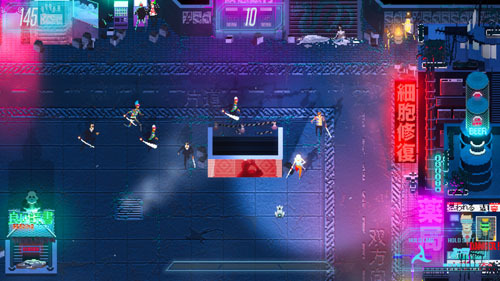 When the player clears out 100 enemies, Katsuro appears, and each time he is killed, he gains new abilities for the next encounter… although his new abilities also carry over between runs, which is counter to the game’s design of resetting all progress upon death. The player’s special meter is drained at the start of the battle, and he must instead rely on his ability to dodge, block, parry, and strike in order to win. In general, the game boils down to killing the bad guys before they have a chance to do the same to you, and to live as long as possible. 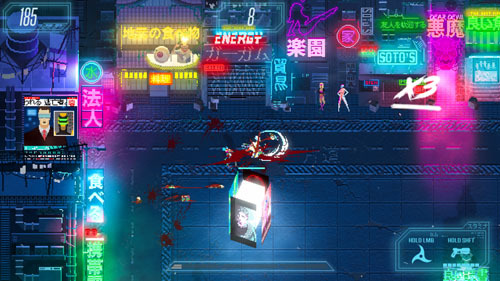 The game is presented in a gritty neon style with colorful neon signs, hard-lit enemies, trash-strewn streets, broken concrete, and lots of dismemberments with blood sloshing across the ground as the player cuts his way through enemy after enemy. The entire game takes place in a single arena. There are several secondary goals, which are presented to the player at the start of each run. 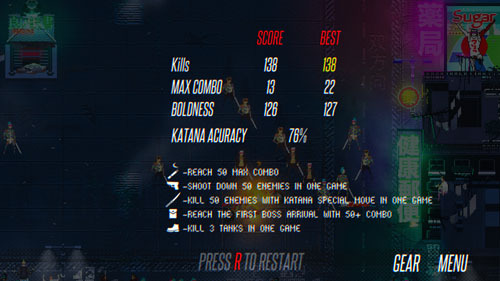 These goals include killing lots of enemies, stringing together long combos, defeating enemies with guns, killing the boss, reaching perfect accuracy with the katana, and killing specified numbers of tougher enemies. By completing these secondary objectives, the player unlocks new items and weapons which may be equipped between missions. For instance, completing the objective that requires enemies to be killed with a gun unlocks new and better guns with varying damage output, ammo capacity, and firing rates. A couple of new katanas can be unlocked which offer new kinds of charged attacks that give the player an edge in combat. 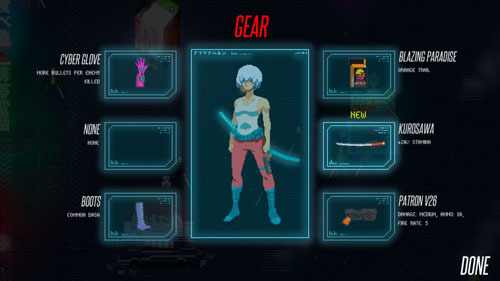 Other items offer secondary stat boosts like the ability to hold more ammo, boots that change the way Akane dashes, and increased time dilation while lining up special attacks. 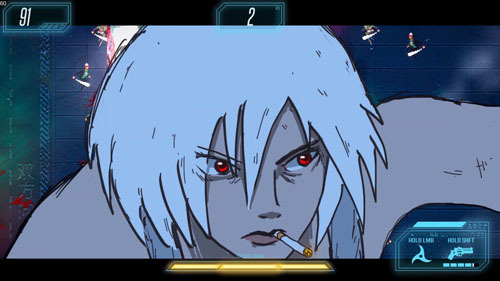 Players can also unlock various sorts of cigarettes that alter the visuals of Akane’s special attacks. Completing these objectives adds a bit of variety to a game that otherwise sees players facing the same enemies in the same arena over and over again. That said, it takes a while for the player to become skilled enough to complete these objectives, and many of them require the player to engage enemies in very specific ways, so the player will need to stick with the game to get better at it. Other games that offer repeated arenas with secondary objectives and unlocks – such as Luftrausers – often provide a number of easier objectives that are earned during the normal course of play in order to give the player a larger sense of overall progress. Akane was developed by Ludic Studios, based in Brazil. 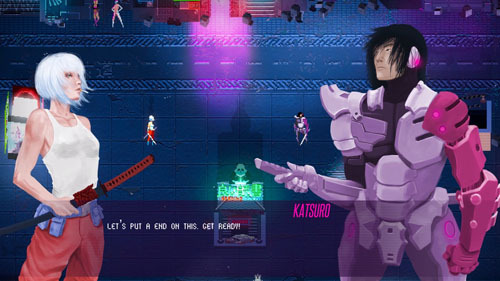 The game was designed and programmed by Lui Gama, with production and programming by Joel Hamon, and art by Artur Ataíde.